Floor mosaic of a Roman villa. 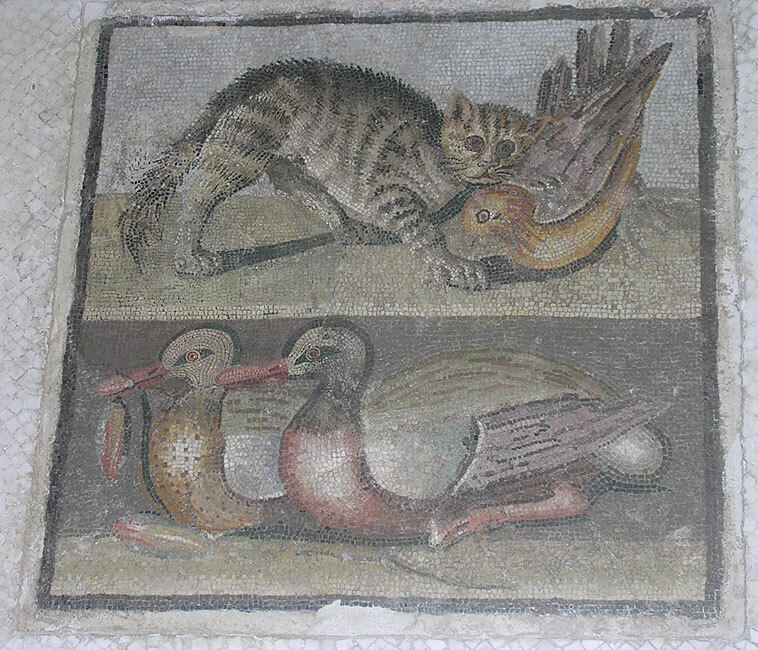 Mosaic with a cat and ducks. The first quarter of the 1st century BCE. Rome, a Roman villa in the via Ardeatina, the possession of Cecchgnola. This floor mosaic with white tesserae features a central panel in opus vermiculatum (micro tesserae) divided in two registers. The panel represents a cat trying to catch a bird in flight and two ducks, one of which is holding a lotus flower in its beak. The style is quite similar to that of Hellenistic painting. The mosaic was found in the triclinium of a Roman villa and can be dated to the first quarter of the 1st century B.C.